The adventure of being an entrepreneur. What a great idea! If you own a company or have an idea in mind you want to put into action, you know what we’re talking about. We at Okodia once had to take that leap of faith, and the truth is that we’d do it again if given the chance. A translation agency is not only made up of professional translators but also specialized translators such as medical translators who, aside from their stint at the translation company, also have hopes and dreams to fulfill. Many years have passed since we decided to take a leap of faith and create our own multilingual translation service specializing in medicine and, as you can imagine, things were far from easy in the beginning. Endless hours of work, searching for the perfect team of collaborators, sending dozens of proposals to find new clients, researching to find sources of information and work tools… During the early years of Okomeds, the truth is that we would have loved nothing better than for an established company to give us a hand, even just to point us in the right direction in our search for information on useful tools with which to start working in the complex field of medical and health translations. And that is precisely what we want to do today, which is to do our bit by telling you young medical translators some of the most useful resources you can find today in the field of medical and health translations. Although Spanish is one of the most widely spoken languages in the world, English continues to be the language in which medical and health professionals prefer to publish their works, studies and discoveries. Most medical documents you’ll have to translate will have English as the source language and what’s more, texts written in other languages usually intersperse words written in the language spoken by Shakespeare. 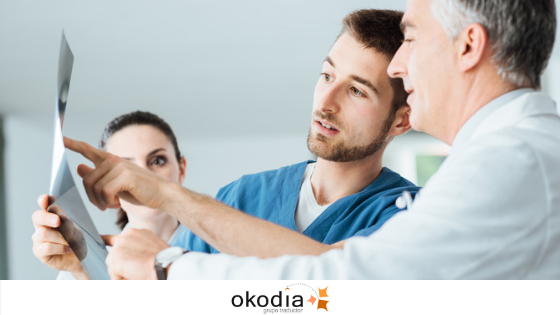 Thus, one of the first resources we can recommend based on our experience with Okomeds is an online journal specializing in health such as the PMC. In this online publication, you’ll find more than 3.5 million specialized articles that—naturally—include all the terminology you’ll need in your everyday work as a translator specializing in health sciences. Another of the leading online medical publications used by the medical translators of Okomeds is the journal commonly know as “The New”. It’s a comprehensive and very up-to-date online journal where any good medical translator—expert or beginner—will find articles, opinions and debates that will help them build up and update their theoretical knowledge as well as master English medical terminology. USC – University of Southern California – is the “culprit” behind this excellent website. We learned of the Norris Medical Library as one of the translators of Okomeds had to give some talks at this prestigious American university. Subject guides, dictionaries, glossaries, links to other online resources, medical portals from different parts of the world, multimedia materials, etc. The Norris Medical Library is a complete web environment full of useful resources not only for translators specializing in medical topics, but also for students and medical professionals who want to stay informed of what’s going on in this highly interesting and critical professional sector.